Ahead of Lok Sabha Elections 2019, politicians are doing every bit of a thing to woo voters. Just like Karnataka Housing Minister MTB Nagaraj, who performed a naagin dance to innovate his campaigning methods. Nagaraj means King Cobra and his naagin dance video is doing rounds on media. 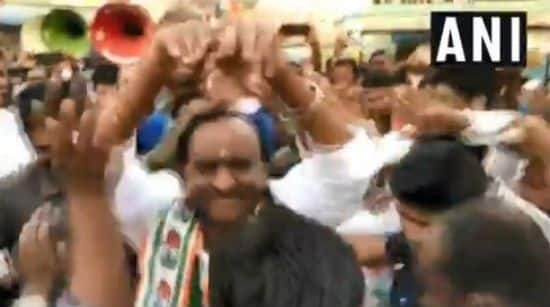 In the video, Nagaraj can be seen with his supporters in Hoskote seeking votes for Congress candidate and former union minister Veerappa Moily, who is contesting from the Chikkaballapura Lok Sabha constituency in Karnataka. Nagaraj’s convoy was followed by a music band that started playing the famous 1954 ‘Naagin’ tune. As soon as the supporters saw Nagaraj dancing, they joined him and it continued for 10 minutes. This is not the first time that the Karnataka minister has flaunted his dance skills in public. He has done it earlier during religious events as well.